Mercy Flights is a ground ambulance and air medical transport service based in Medford, Oregon. Holland, Manitoba is an unincorporated community recognized as a local urban district in the Rural Municipality of Victoria, in Manitoba. Stony Mountain Institution is a federal multi-security facility located in Stony Mountain, Manitoba, about 18 kilometres (11 mi) from Winnipeg. The medium security prison opened in 1877, the minimum security unit opened in 1962 and the newest addition to the prison, the maximum security unit, opened in 2014. While watching aircraft at Winnipeg International Airport as a form of inexpensive entertainment, Leishman had occasionally seen gold shipments from Red Lake being flown into the airport for transport via Air Canada to the mint in Ottawa. While incarcerated in Stony Mountain Penitentiary, he formed the basics of the idea. Albert Spaggiari, nicknamed Bert, was a French criminal chiefly known as the organizer of a break-in into a Société Générale bank in Nice, France in 1976. 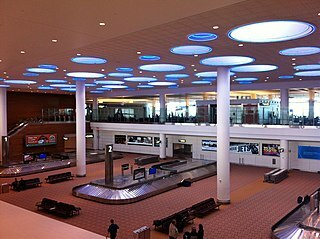 Winnipeg James Armstrong Richardson International Airport is an international airport located in Winnipeg, Manitoba, Canada. It is the seventh busiest airport in Canada by passenger traffic, serving 4,305,744 passengers in 2017, and the 11th busiest airport by aircraft movements. It is a hub for passenger airlines Calm Air, Perimeter Airlines, Flair Airlines, and cargo airline Cargojet. It is also a focus city for WestJet. The airport is co-located with Canadian Forces Base Winnipeg. Rick Borotsik is a politician in Manitoba, Canada. He served as Mayor of Brandon from 1989 to 1997, was a member of the House of Commons of Canada from 1997 to 2004, and was elected to the Legislative Assembly of Manitoba in 2007. Borotsik is a member of the Progressive Conservative Party of Manitoba. The Progressive Conservative Party of Canada ran a full slate of candidates in the 1997 federal election, and won 20 seats out of 301 to emerge as the fifth largest party in the House of Commons of Canada. Many of the party's candidates have their own biography pages; information about others may be found here. The Air Operations Branch is a personnel branch of the Canadian Forces (CF). All members of the branch wear air force uniform. Henry "Harry" Marshall Erskine Evans was a politician in Alberta, Canada, and a mayor of Edmonton. Ken Courchene is a former Chief of the Fort Alexander Indian Band in the Canadian province of Manitoba. He has been sued by the federal government for his alleged role in the Virginia Fontaine Memorial Treatment Centre controversy. David K. "Dave" Burgess is a politician in Brandon, Manitoba, Canada, who was mayor of the city from 2002 to 2010. His father, Ken Burgess, was Mayor of Brandon from 1979 to 1989. Konrad Jonasson "Konnie" Johannesson was a Canadian aviator and ice hockey player who competed in the 1920 Summer Olympics. As a pioneering aviator, he was instrumental in flight training as well as airport administration. Gerald Daniel Blanchard is a Canadian best known for orchestrating complex frauds and heists on three continents. Canadian Airways Limited was a Canadian regional passenger and freight air service based in Winnipeg, Manitoba. It traced its history back to the founding of its precursor, Western Canada Airways (WCA), by James Richardson in 1926, and was fully established in 1930 following WCA's acquisition of a number of smaller regional competitors. At its peak, Canadian Airways had a total of 51 aircraft of various types that provided both regular scheduled service between settlements as well as charter service to bush locations. Canadian Airways was absorbed into the fledgling Canadian Pacific Airlines in 1942, following Richardson's death three years earlier. Wilfred Leigh Brintnell was a pioneering Canadian aviator. Francis Roy Brown was a politician in Manitoba, Canada. He served in the Legislative Assembly of Manitoba as a Liberal-Progressive from 1953 to 1958. Ontario Central Airlines was a Canadian airline headquartered in Kenora, Ontario. It was founded in 1947. In 1984, the airline was renamed Nunasi-Central Airlines. Heather Margaret Robertson was a Canadian journalist, novelist and non-fiction writer. She published her first book, Reservations are for Indians, in 1970, and her latest book, Walking into Wilderness, in 2010. She was a founding member of the Writers' Union of Canada and the Professional Writers Association of Canada, and launched the Robertson v. Thomson Corp. class action suit regarding freelancers' retention of electronic rights to their work. Group Captain Acheson Gosford Goulding was a Canadian World War I flying ace credited with nine aerial victories. After infantry service, he transferred to aviation and served in Asia Minor and the Balkans. After winning the Military Cross for courage, he returned to civilian life. He gave up a business career to return to service for World War II as a Group Captain. Bush Pilot: Reflections on a Canadian Myth is a 22-minute Canadian documentary film, made in 1980 by the National Film Board of Canada (NFB) and directed by Norma Bailey and Robert Lower. Shot in northern Manitoba, the film explores the myth of the bush pilot as a heroic and iconic figure in the Canada's north. Major-General R.W. Fassold OStJ, CD, QHP, BSc, MD was the 29th Canadian Surgeon General. Born in London, Ontario, Robert W., was educated at "the University of Western Ontario, where he earned" a bachelor's degree in Science in 1955, and a Medical Degree in 1968, "under the Military Medical Training Plan (MMTP)." He was the first to graduate under the MMTP. He also completed graduate studies in 1971 at the University of Toronto, in Public Health, and in 1972 "at the United States Air Force School of Aerospace Medicine, Brooks Air Force Based in San Antonio, Texas." ↑ Barnes 2008, pp. 104–110. ↑ "Presumed dead, Flying Bandit 'alive'." The Montreal Gazette, September 26, 1980. 1 2 3 "Documentaries:'Ken Leishman: The Flying Bandit'." Archived 2013-01-01 at Archive.is Telefilm Canada. Retrieved: January 21, 2016. ↑ Schroeder 1997, p. 172. ↑ Barnes 2008, p. 106. 1 2 Schroeder 1997, p. 161. ↑ Dreidger, Mary Lou. "Account by the lawyer retained to defend Backlin." maryloudriedger2.wordpress.com, March 21, 2012. Retrieved: January 21, 2016. ↑ Redekop 2002, pp. 81–82. ↑ Redekop 2002, pp. 89–90. ↑ "Ken Leishman." The Manitoba Historical Society. Retrieved: January 21, 2016. ↑ "Daily Book Review: Inside the life of Canada's rock-star criminal." Globe & Mail, July 7, 2011. Retrieved: September 28, 2011.